My AOW bookswap parcel finally arrived. Thanks Chirsty :) I felt like a child waiting for Christmas day, and when I took the little packages out of the envelope I let them sit in the table and stared at their beautiful wrappings and ribbons for a while. Then I could not wait anymore and I had to open them. I am a spoiled girl. Chirsty did not send me one, but two books, both of which I haven't read. 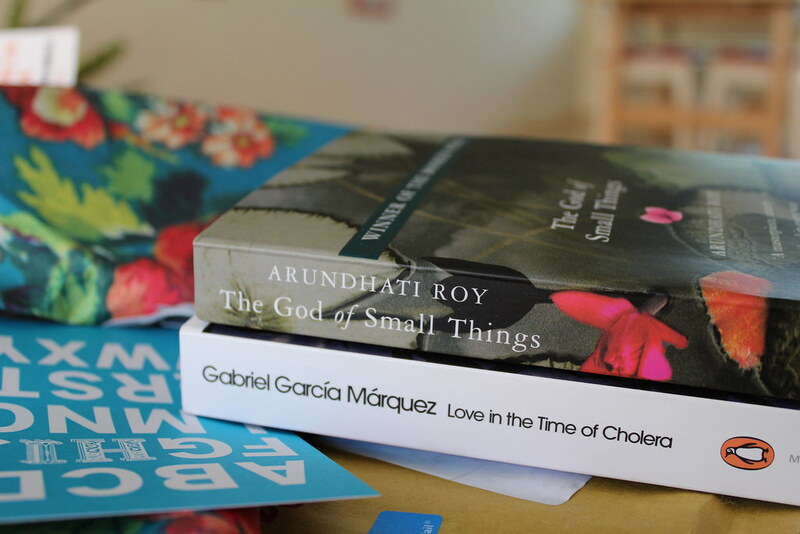 The first one: "The God of Small Things" by Arundhati Roy had been on my 'should-read-this-book' list for a long time, and I believe it will fit perfectly with my mantra for 2013: 'joy all year'. The second book I got is "Love in time of cholera" by Gabriel García Márquez, another classic, which I haven't read. I will make the boy read it too, because he has to get an introduction to magic realism. In case anyone is curious (because you all know I'm an oversharer), I'll delight you with my answers to the AOW book swap questionnaire, which you had to answer before it got sent to your assigned swapper and with which hopefully your magic pen pal (anyone who makes books arrive to my doorstep is magical) would hope to find a book you'd like. Oh and if you are curious about other people's answers (notably Aisling, Anna and Clare, who organized it, plus some of us in the comments go here). And here's a glimpse of what other people have gotten. 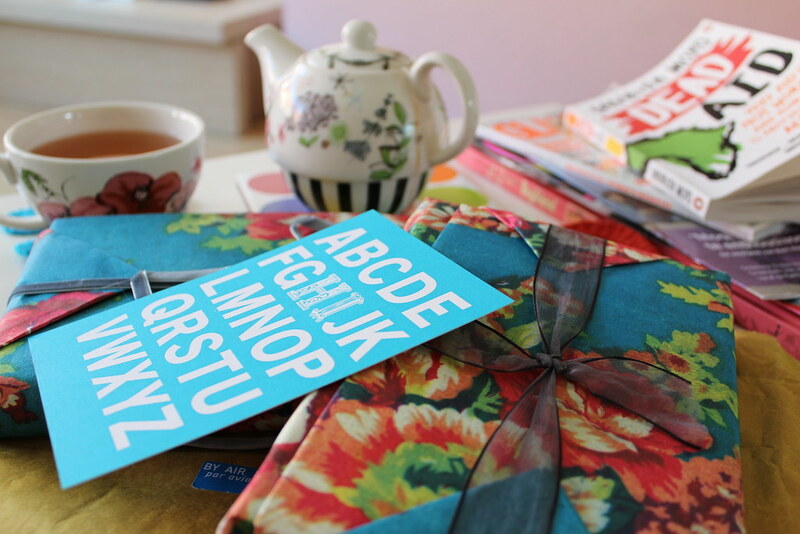 Pretty packages are the best thing ever aren't they? - Who is your favourite author? -What is your favourite book of all time and how would you describe it in three words? Rayuela (Hopscotch, Julio Cortazar). Magic, Coincidences/Serendipity, Love-story-in-Paris. -What was the best book you read in 2012 - again, describe in 3 words? Leonora, by Elena Poniatowska. It is the biography of Elena Carrington. Fascinating, Rebel, Animal lover, ahead of her time. -What was your least favourite book you read in 2012 and why - in no more than 50 words? - If you could only take 3 books to a desert island, what would they be? -What was your favourite book as a child? Hans Christian Andersen-s fairy tales, I read the Chronicles of Narnia later, when I was around 12, and loved them too. 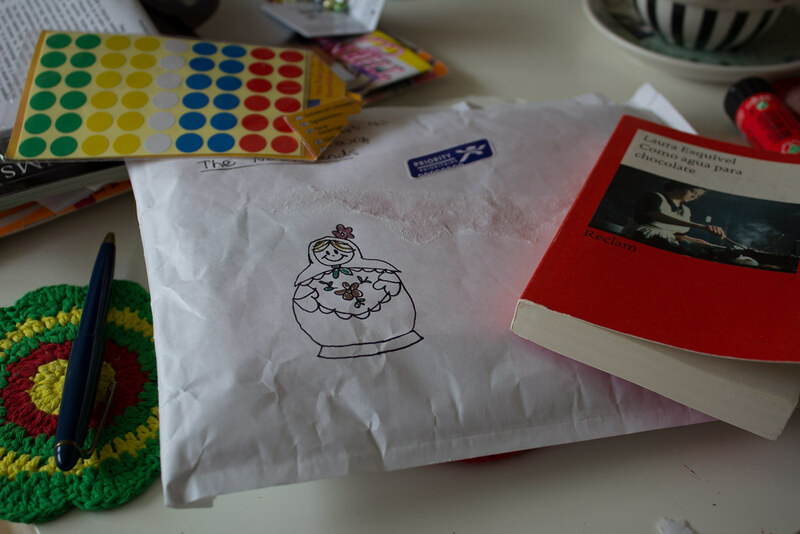 This is how the package I sent looked like, though the book I sent is not the one on the photo, but "Tear this heart out" ('Arráncame la vida, by Angeles Mastretta). I saw the idea of drawing on envelopes on pinterest and totally had to try it. Oh and I have some good news. Remember I took the NT2-II (official exam of Dutch as a second language) at the end of January? Well the results were released yesterday and I passed! I couldn't believe it, I was sure I had to redo at least one part, but no, I passed it all. I might have spent the whole afternoon jumping up and down while singing: "ik ben geslaagd, ik ben geslaagd, ik ben geslaagd, ik ben geslaagd!". I keep trying to convince the boy that I should get this dress in reward of my efforts (too bad it is obscenely expensive). How funny! I have a funny relationship with The God of Small Things. First, I checked it out from the library, started reading it while tipsy, forgot everything I read (due to tipsiness), then accidentally returned it to the library without reading it. Then, someone gave it to me. I started reading it, and then realized "Wait a sec, I've already read this..." and THEN I found out I was pregnant and NOW it's sitting on my bedside table, half read, buried under pregnancy books. Oops. Gotta get through it. Also, Love in the Time of Cholera. I love Marquez, took a class on him, but my brain fights against magical realism. I started "Cholera" twice. Once in spanish, once in english. Now it's sitting on my bookshelf. Damn. Gotta get back to that. I DiD read 100 Years of Solitude fully through, in Spanish. Proud of that. Not sure how much I understood though...ha. I say it's a sign. 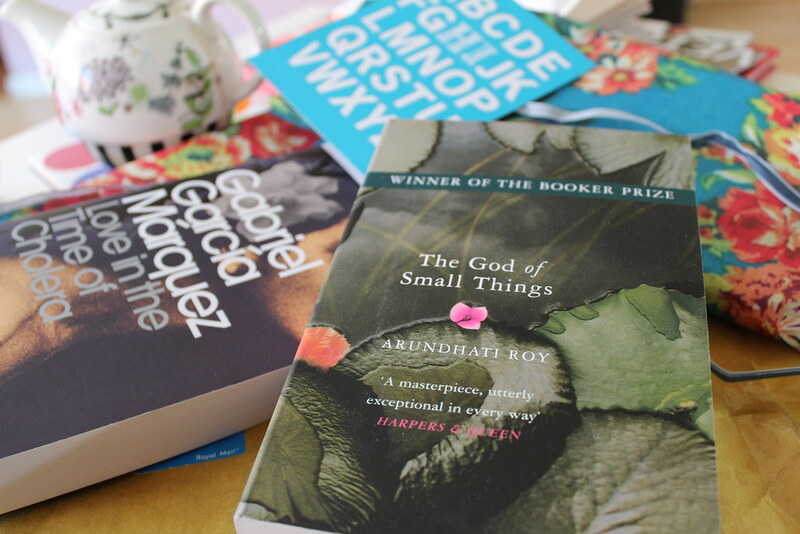 You should read The God of the Small things (then we can talk about it !!! ). And now you will have time! (Well at least at the end of all of this). I have also fought against magical realism because I do not understand all of it, specially my younger, rational self. My best friend was crazy about it and kept talking about it. I want to give it another try. You should read "Rayuela" (Julio Cortazar). It's my favorite book ever. And Narnia books are so full of wisdom. I also have them all together in 1 book with the original drawings. Thanks! I will! I would also recommend In the Time of the Butterflies/En el Tiempo de Las Mariposas (choose your language) by Julia Alvarez. And, for something fun, The Dirty Girls Social Club/El Club De Las Chicas Temerarias by Alisa Valdes Rodriguez. Oh, and congrats on the Exam!!! I remember when I passed the Berlitz testing for Spanish fluency at work (nowhere near as exciting I'm sure), but I was so proud of myself that a national testing agency had deemed me "fluent." Languages are amazing, aren't they? Thanks so much :) Languages are great yeah, communicating, understanding, learning a new culture. Of course Spanish is exciting ! You can use it in lots of countries! Congrats on the exam :-) You should definitely get that dress, its gorgeous and I think it would really suit you!! I have read Love in the time of cholera but wasn't that keen on it, not really my kind of book. I started 100 years of solitude and only managed about 50 pages before giving up!!! I have heard good things about The god of small things though. Thanks so much. That dress is perfection, but it's also designer, I found it while looking for something else (oh google). I think even if I had the money I would feel guilty paying for it. But I can look for something similar. I saw the movie Love in the time of Cholera, which was quite good. I still have to year 100 años de soledad. I have been hearing about The god of small things, I am so curious about it. Congrats on the exam! That must feel awesome to have passed it, full stop, especially when you didn't even have to take it. I would agree with you though that the dress is an appropriate reward. Appropriate and gorgeous. 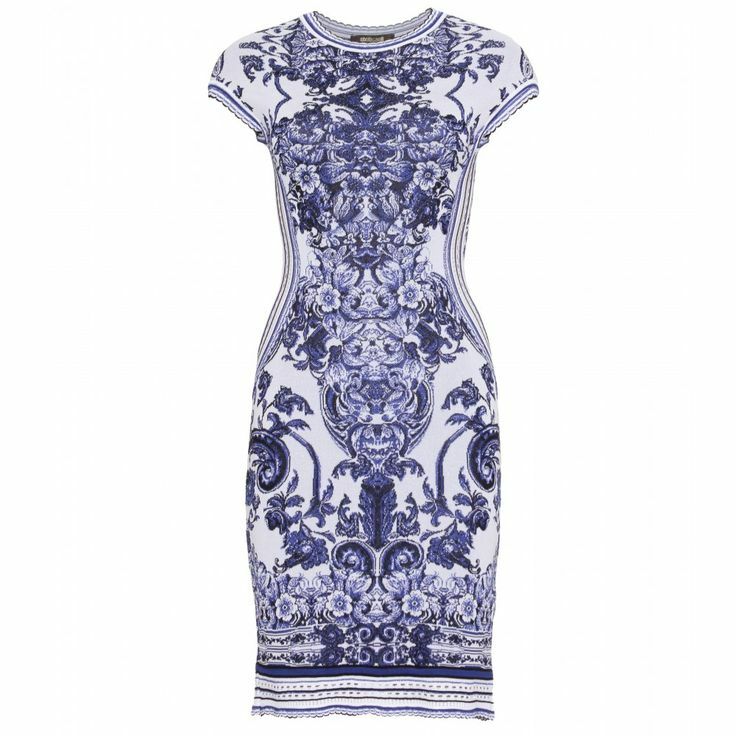 Thanks so much, it does feel great :) And the dress is beautiful, and appropriate... and worth a month's salary (it's 970 EUR), I just found it by accident (and fell in love) while googling "Delft tile" because I wanted to draw the designs. Oh my goodness. That is crazy expensive. Crazy designer stuff. I think it's almost inmoral, given the state of the world. Sometimes I see the dresses that celebrities wear, and I fantasize, and I wish I could wear stuff like that, and then I feel guilty for even wanting it. But clothes are oh so pretty. Dank je wel :) Ik ben zo blij, ik geloof ik niet ! I love the little image you've drawn on that envelope. I have a special place in my heart for Russian dolls, since they remind me of my son who died in 2010. His receiving blanket (the only thing we have of him) had Russian dolls as a motif. The God of Small Things is one of my favourite books. I recently re-read it, and it was just as good the second time. Though I have to warn you, it's images are dark and sad and a little strange, so not that joyful. Still, read it! It's one of the few books that really got under my skin and stayed for a long time. It is nice to have something that reminds you of your little one. He will always be with you, you know? I am reading "Eating animals" and there was a story of a couple who lost their baby 20 days after he was born (I can't even start to imagine the devastation). But the story continues to say how they felt grateful for those 20 days the baby was with them, they were worth it all. Thinking and hoping for you. I am very curious about The God of Small Things now. To be truthful I started it 8 years ago or something, and I could never get into it. But this time I will read it. Congrats on passing the exam!! You totally deserve a reward; the dress is beautiful! You should find something similar or just equally awesome for yourself. Thanks :) Yeah we still did not celebrate :) We've been busy these days :) But we'll do something for sure! El amor en los tiempos del colera es HERMOSO (pero por favor, no te pierdas la prosa de García Marquez en castellano! ), pero no se si es el ejemplo más claro de realismo mágico, que sí llega a su máxima expresión en 100 años de soledad. Animate, animate! Y si no entiendes algo, me avisas que soy FANATICA del genero. Eso si, Garcia Marquez ha dicho bien claro que la denominación de "realismo magico"es europea, porque en latinoamerica esas cosas pasan y tiene razon (lee su discurso de cuando recibió el nobel, que es una maravilla). Hace mucho que tengo ganas de leer el dios de las pequeñas cosas, qué titulo tan bonito, no? Espero que te guste mucho, luego me cuentas, si? Yo envío mi libro mañana porque recien ahora llegó. Quería un libro en particular que no estaba aqui y tuve que encargarlo (Half of a yellow sun, de Chimamanda Adichie)asi que recien ahora puedo enviarlo. Luego tomo fotos del paquete. Yo aun no recibí mi libro tampoco, a ver qué me llega! Claro, lo leeré en español, siempre he pensado que de ser posible, a cada autor hay que leerlo en su lengua materna (hasta me compre el Fausto en alemán, pensaba que aprendería en 6 meses), siempre que sea posible. Con las traducciones se pierde. 100 años de soledad lo tengo pendiente pero está en mi lista. Y García Marquez tenía razón, esas cosas pasan en Latinoamérica. Voy a buscar su discurso. De todos modos este libro será útil para cuando Mark lo lea, tener a la traducción para comparar lo que no entienda. En cuanto acabe el dios de las cosas pequeñas te aviso, y el título es precioso..
Tengo a Chimamanda Adichie en mi lista, encontré por 2 EUR un libro con cuentos e historias sueltas, a ver que tal. Ese vestido me hace soñar, jaja un día de estos. Oh funny, I got sent the same book through the AOW book swap! "Love in the time of Cholera" :) I've started it and the narrative is definitely very beautifully written but it's a bit dense and the story seems almost secondary to the descriptions. But I'll persevere! Would love to hear what you think of it once you get to it! Oh yes, it is easy to get lost in descriptions in this kind of book, makes it difficult to read sometimes. I haven't started yet but I will let you know when I read it (Though I will read the God of the Little things first).